When you have an occasion to send business get well cards, you don’t really want it to look like a corporate get well card. I mean, it should be friendly and attractive as opposed to stodgy and bland. 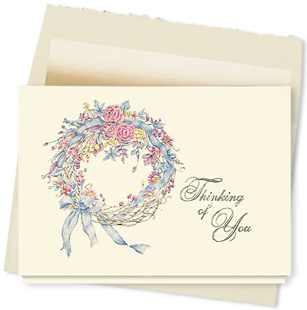 When I look at design #222AY, Victorian Wreath Thinking of You Card, I see a soft and caring motif with the simple “Thinking of You” next to the stunning loosely woven wreath. The delicate mauve roses and ecru berries are discreetly interwoven with the pastel blue ribbon. Not only can this design serve as a business get well card, but “Thinking of You” are words that can cover a variety of happenstances. 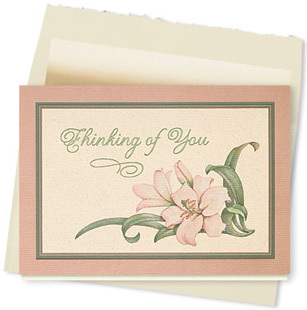 One could use greeting S4, “Thinking of You at this Time,” or leave the card blank and express a personal message. While my inclination would have been to write the words in blue rather than green foil, it doesn’t merit changing because it is still very appealing in the green foil.